Willow & Co is having a fantastic contest through the 1st of September and I am so excited to have this outfit finished in time to enter. 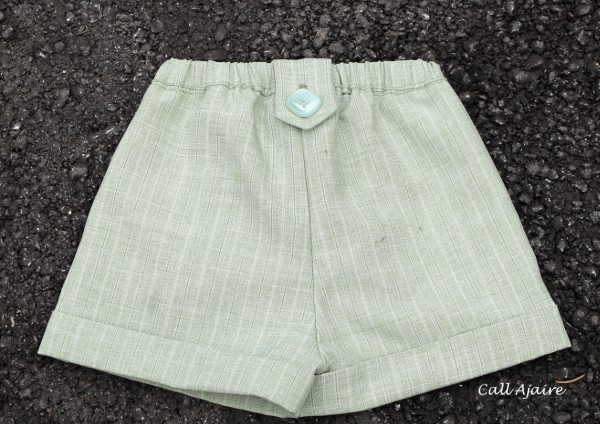 I’ve had my eye on the Clover Shorts designed by Hayley from Welcome to the Mouse House for Willow & Co since the pattern was released. I even bought the pattern ages ago, but haven’t had a chance to sew them until recently. I have to say the pattern comes together quickly for one with so many great details. 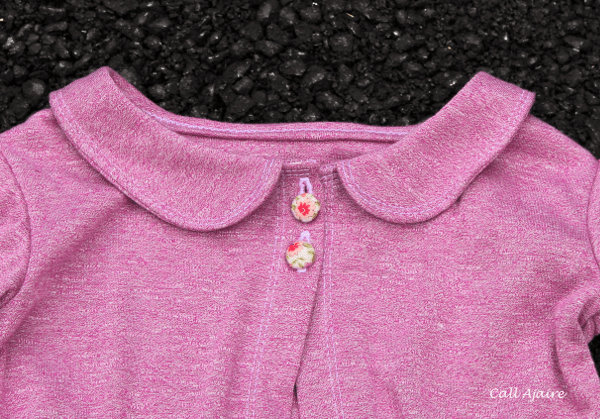 The flat front with elastic backed waist is my favorite style, but add in those buttons tabs and it ups the cuteness factor tenfold. I found some square-ish buttons in my stash that were the perfect color to go with the green of the fabric. You don’t need to make actual buttonholes for these tabs since they aren’t meant to be undone, but I couldn’t help myself. They just look so much better with the real buttonholes right? The fabric is a lightweight suiting from JoAnn that I bought awhile ago. 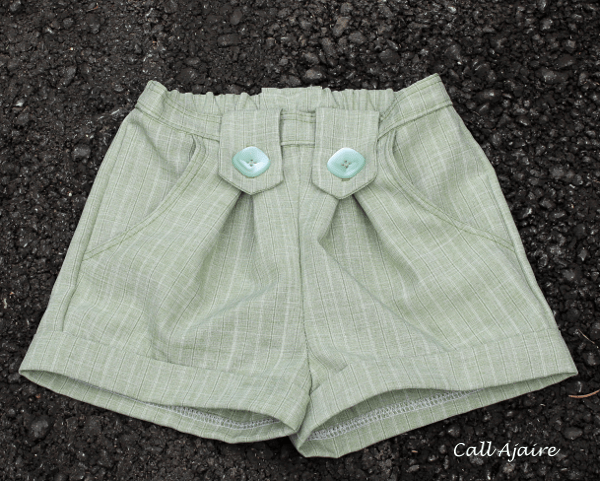 It has a nice drape and feels so soft that I’m sure these shorts are really comfy to wear. I can’t wait to pair them with tights once the weather gets chilly. The pleated fronts will look so cute with tights! The cardigan is another Aster Cardigan designed by Vanessa from LBG Studio for Willow & Co and I just love it. I used the rest of the light weight orchid knit that I used for my Pleated Playsuit here and again I doubled up the fabric to give it some body. Using two layers of a delicate knit and treating them as one isn’t the easiest thing to do, but I adore the color and wanted the cardi to have some heft so I went for it. It turned out to be the perfect weight for layering and I know it’ll be worn a ton. I was questioning the buttons after seeing them with the finished sweater. I originally wanted to use some fun buttons I made with scraps of Cotton + Steel, but they didn’t feel right. Maybe a little too funky for this particular outfit? Anyway, I decided to make some buttons from the double gauze I used for the top and I liked the look, but I still couldn’t decide cause I LOVE the Cotton + Steel ones. In the end I turned to Instagram for opinions and everyone seemed steered in the floral direction I was going so it reaffirmed my choice. I really love the final look and can’t wait to use those other buttons in something else soon. The top is the Tobago Tank from Sis Boom that I made earlier this month. The colors in the floral look so good with the greens in the shorts and I needed to pair them. In fact, I was hoping to have the shorts finished before I took the original tank pictures, but alas I had too many other things on the sewing table at the time. Finally seeing them together is so satisfying. I wanted to pull in a cardigan since we’re heading toward autumn and think this orchid is a great color complement without being too matchy matchy. Adding the floral buttons pulled everything together and I couldn’t be happier. 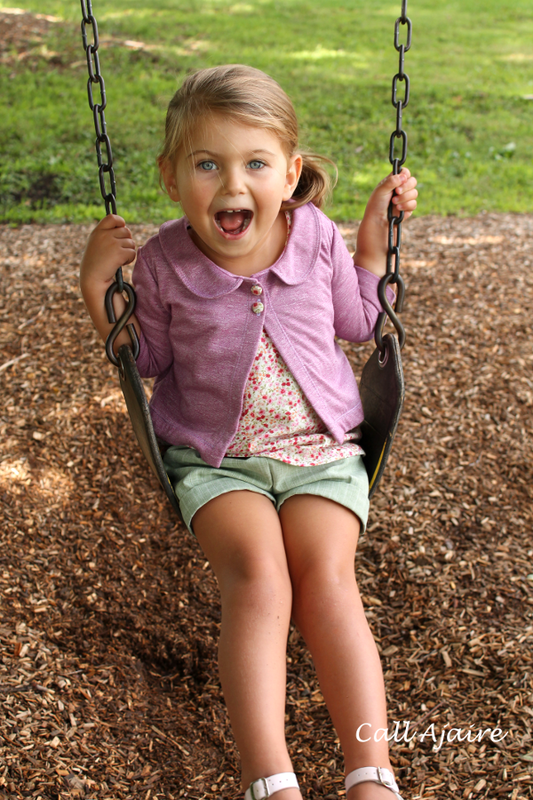 Bean starts preschool next week which is all very exciting. She’s three and up until now it’s just been me and her together every day so even though school will only be two days a week for a few hours I think she’s going to love it. She’s really looking forward to it, so fingers crossed all goes well. No matter what, this will make a great first day of school outfit. She will do great in school! I love the orchid in the Aster. I have not yet made one up, but M will be in preschool this year as well and has finally decided that sweaters are ok to wear. So I see an Aster or two in our future. Donna I think it'll be perfect for extending the life of all these summer tanks and no sleeved tops. And really the aster is such a great pattern. I can't recommend it enough 🙂 I can't wait to hear how m likes school too! I can't tell you how much I love those little shorts. So pretty!! Really love this outfit! She looks lovely in it! This is gorgeous Ajaire!! 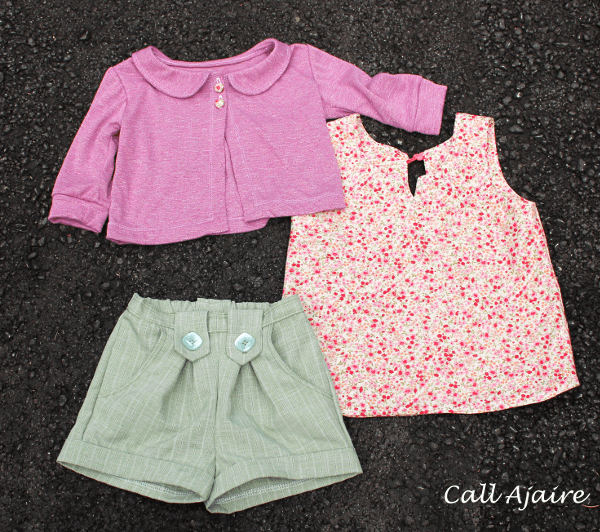 The buttons on the cardi are just the sweetest detail and the shorts are perfect! I have the Clover pattern but am sitting on it for now since the weather here is 60-70s at the moment. Bummer. But this is the perfect version. Great job!! 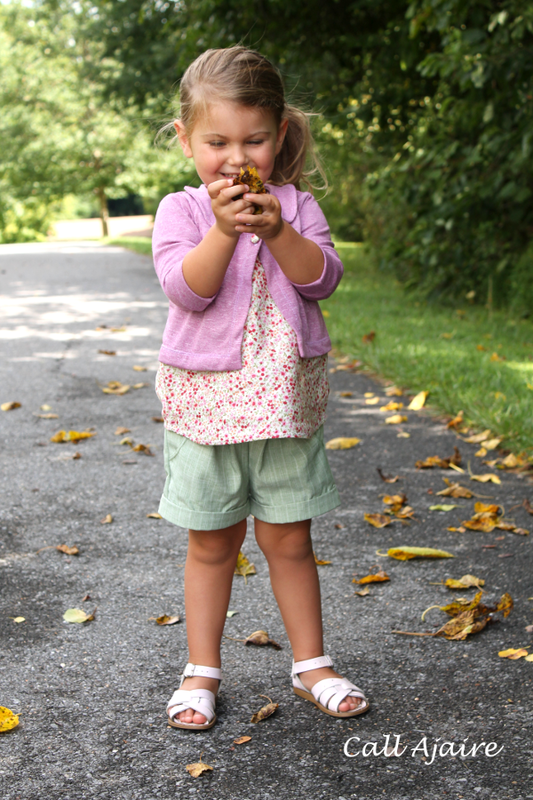 Pretty sure I need those clover shorts. She looks great! This outfit is darling! I especially love the shorts. They look dressy yet comfy. Love the colors! I remember that knit from the knit challenge! I'm glad you decided on the floral buttons! Looks like the perfect back to school outfit.